The newly overhauled StrongVPN is very easy to use and is a great choice for users new to VPN services. Simplicity is something of a theme in the VPN services we’ve looked at recently, and StrongVPN follows suit. This newly overhauled VPN is all about reducing choice to make it as easy as possible to get online. While there aren’t a ton of extra options, there are still some key choices that longtime VPN users will appreciate. When you first open up StrongVPN you’re greeted with a map, a button for choosing location, and a button to connect. By default, StrongVPN chooses the closest server for the best possible speeds. If that’s not to your liking, click Best Available Location to see StrongVPN’s location listings. StrongVPN’s locations are limited, but it has enough servers in various countries throughout the world to satisfy most users. One thing I’d like to see in the county listing is some kind of guidance about the various connections, such as a percentage of its current capacity or the ping time from my PC. Currently, however, it just lists the country and the city. Once you’ve chosen a location, click Save at the bottom of the list, and the server listing screen automatically closes. Back on the main screen click Connect and you’re off to the races with your preferred location. First and foremost, StrongVPN was able to access U.S. Netflix in my tests. The company doesn’t advertise the ability to get around Netflix’s regional restrictions, but at the time of this writing StrongVPN obliged. That could change, however, at any time. There is not a lot to StrongVPN in terms of extras, making this a solid choice for beginners or users looking for simplicity. Click the settings cog in the upper right-hand corner of the app, and the options screen opens. Under the Options tab there are some generic options such as “Start when Windows starts,” “Auto reconnect,” and “Connect on launch.” There’s also a kill switch option that kills all internet activity if the VPN connection drops, but at this writing the feature was not active. The only other place in the app to do any tweaking is under the Protocol tab. 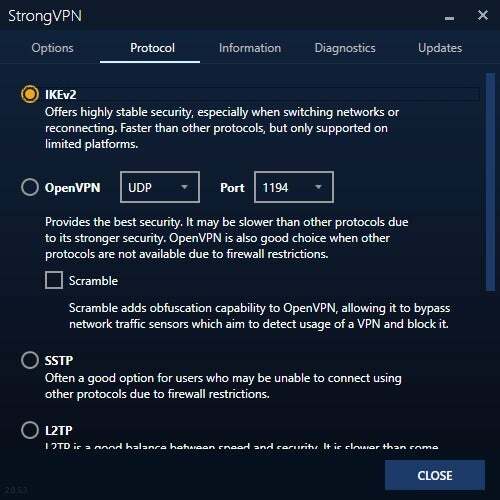 StrongVPN defaults to the IKEv2 protocol on Windows, but there are also options for OpenVPN, SSTP, and L2TP. The other tabs are just for looking at your account, diagnostics, and app updates. StrongVPN costs $70 per year or $10 per month. 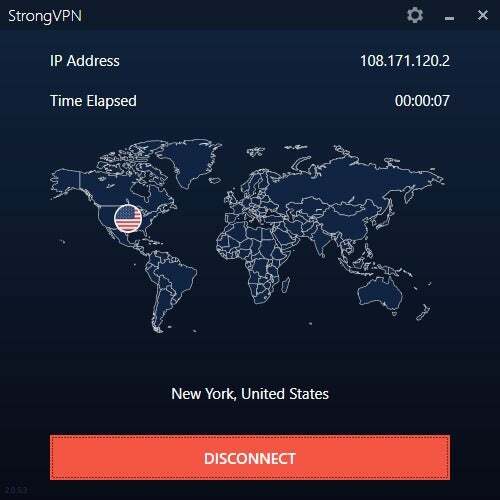 StrongVPN supports up to five simulataneous connections on one account. There are apps for Windows, Mac, Android, and iOS. There are also manual setup instructions for routers, Linux, Synology NAS, Kodi, Kindle, and Chrome OS. If that’s not enough, you can get legacy support instructions for Windows 7 and XP, macOS 10.5, and the Boxee Box. StrongVPN performed fairly well with some great speeds in the U.S., UK, and, surprisingly, Australia. Overall, StrongVPN scored an average 30 percent of base speed across five locations. That puts StrongVPN in the middle of the pack of all the various services we’ve tested. The aforementioned countries all scored well over 30 megabytes per second. Oddly, the Germany connection scored lower than Australia with a sub-20Mbps speed. Again, your results may vary, but the bottom line is that StrongVPN should be fast enough for most people’s needs though it doesn’t top the speed charts compared to other VPNs we’ve tested. StrongVPN is an independent subsidiary of web services company StackPath LLC, which also owns IPVanish. The VPN's business address is 1920 McKinney Avenue, 7th floor, Dallas, Texas 75201. David Edwards leads the company's network and operations, and Doug Haden runs management and support staff. The team is listed on the company’s About Us page. StrongVPN makes all the privacy promises you’d expect from a VPN. The company doesn’t collect or log any web traffic or any other internet use of its VPN service. As for payments, it offers all the standard credit card options, as well as PayPal, Bitcoin via BitPay, and Alipay. This allows for varying levels of relative anonymity, with Bitcoin being the strongest. StrongVPN is very easy to use, and the speeds are reliable and good enough for most users. If you are new to VPNs then StrongVPN is a good choice. Power users who are mostly concerned about the protocol they use will also like what they see from StrongVPN. But if you are more concerned about granular server choices based on current performance, dedicated servers for P2P file sharing and Netflix unblocking, or a wider choice of countries, then StrongVPN may not be the best choice for you. 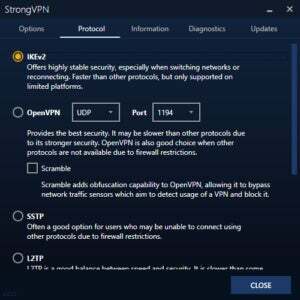 StrongVPN strikes a middle ground by providing important features for VPN basics without going overboard in feature choices. 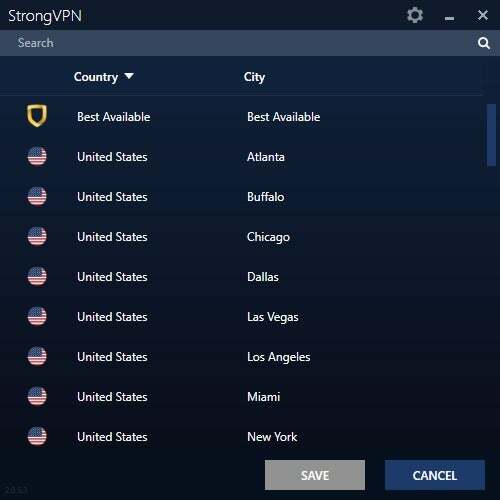 StrongVPN is a great choice for VPN newbies who just want to get online. It doesn't have the largest location listing we've seen, but it's a good list with enough choices for most people. Speed demons can probably find a better service elsewhere, but the company's speeds are serviceable for most uses.